The Whirlpool Galaxy as seen in different kinds of light, including radio waves. Human eyes are built to collect and focus light that is bouncing off of the world around us. We call this light “visible light,” because, well, we can see it. This implies that “invisible light” must also exist. Indeed, from some startling discoveries in the 1800s, we learned that humans see only a tiny fraction of the light bouncing all around us. If you grab a CD or DVD and twist your wrist with it, you will see a rainbow of colors on the disc. The tiny particles in the disk break up visible light into its natural spread of colors from red to violet. You probably already knew this. Beyond the visible rainbow are “colors” too red and more violet than our eyes can see. Owls and bugs have no trouble seeing these colors (respectively), but that’s because their eyes are built differently than ours. To us, these unseen colors remained unknown until a chance discovery in an observatory in Slough, England in 1800. Astronomer William Herschel was using a telescope to view the Sun. He was wearing different sets of dark, filtered glasses to look at the Sun in different ways and to protect his eyes from the blinding glare. Some glasses filtered out more light than others, but with most glasses, he still felt the heat of the Sun. Wearing other glasses, however, he discovered that he felt less heat. He was not expecting that. How could his glasses filter heat the same way as they blocked visible light? Herschel thought this only made sense if light and heat were somehow a similar type of thing — if what he felt as heat was actually his skin sensing an unseen light. After a few experiments taking the temperature of colors along a rainbow he created with a prism, he convinced himself (and the world) that a thermometer measured the most heat in the area past the red light. He had discovered below red, “infrared,” light. If invisible light shines beyond the red end of the rainbow, could another invisible light shine beyond the violet? Chemist and inventor of the battery, Johann Ritter, believed so. Ritter put together a different experiment using a rainbow created by a prism and a chemical that turns dark when it is in sunlight. When placed in each of the rainbow’s colors, from red to violet, the chemical got darker and darker. However, it became the darkest past the violet, where there was no seeable color. Eureka! Above violet, “ultraviolet,” light was found. Scientists later found invisible light “shining” well above ultraviolet, called X-rays and Gamma-rays. 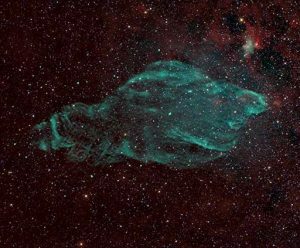 This enormous expanding cloud of gas called W50, the Manatee Nebula, is invisible to optical telescopes. In 1886, when Heinrich Hertz proved that he could generate and receive a kind of invisible light in wavelengths longer (well below) infrared wavelengths, these became known as Hertzian Waves. Hertzian Waves were so long that they could be modified to carry smaller, man-made signals along them — a application of his discovery that Hertz never considered, but many others, like Nikola Tesla, did. A signal, in the form of squiggles of smaller peaks and troughs, can be fit into the distance between a peak to another peak in a Hertzian wave. The longest waves are like cargo trains: an encyclopedia of details about the source can be packed between their distant peaks. Antenna broadcasting stations still use the incredible length of long radio waves to carry their complex music and spoken word signals. The waves make no sound, however; they only carry a sound signal on them. Your radio receiver extracts the signal and sends it to a speaker where the signal’s alternating peaks and troughs vibrate magnets that pulse the air and create sound waves in it. In truth, all light waves act like cosmic couriers, carrying bundles of information away from every radiating source. Telescopes and their sophisticated receiving equipment, be they spectroscopic cameras or supercooled receivers, extract the data bundles from waves of every length and frequency. In the late 1920s, Bell Laboratories began planning a system of transatlantic wireless communications using these radio carrier waves. They needed to know about sources of radio waves that might interfere with their plans, and put a young physicist, Karl Guthe Jansky, on to the task. In 1930, Jansky built his now famous “merry-go-round,” a bridge-like frame of antenna wires set on a spinning base. A motor turned his merry-go-round throughout the day and night to listen for interference at a very specific wavelength, and indeed, he found plenty coming from distant thunderstorms …and shockingly, from the center of our Galaxy. When Janksy published his finalized results in 1933, the field of radio astronomy was born. Despite making the cover of the New York Times, Jansky’s result mostly stymied astronomers who did not have enough of a background in radio technologies to pursue advancement of radio observations of the Universe. 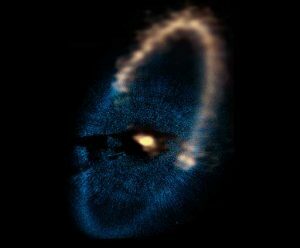 Millimeter-wave telescopes like ALMA can see the rocky and dusty building blocks of planetary systems (gold) forming around other stars like Fomalhaut. A young engineer in Illinois named Grote Reber was inspired to build a radio antenna of his own to continue Jansky’s work. He used a dish design to gather and focus a wider range of radio wavelengths than Jansky’s one-wavelength pole antenna could. Reber’s parabolic dish antenna became the model used by all large dish radio telescopes around the world. Waves hit the dish, and because of its mathematically perfect parabola shape, the dish bounces the waves back up to a point called the focus. At the focus, a scientist can place a receiver to pick up the waves or else place a mirror to bounce the waves straight back down through the middle of the dish to additional receivers inside. Unlike a pole antenna, a dish is not tuned to any specific wavelength, so astronomers can use a variety of receivers to observe different structures in the Universe with the same dish telescope. Reber learned almost immediately that a range of radio waves is indeed coming from the Universe, but the laws that determine the brightness of those radio objects are not the same as those for visible objects. Temperature is the gauge by which we typically predict the wavelength brightness of a visible object – the hotter it is, the brighter it appears in shorter wavelengths, or the bluer it will shine. For radio objects, Reber discovered the opposite can be true: the brightness of the radio signal he observed from the center of our Galaxy decreased with the wavelength with which he observed it. A decade of experimentation later, and physicists discovered that a common class of radio waves is made by electrons spinning around a magnetic field – no temperature required. Reber’s citizen science experiments led to the discovery of synchrotron radiation and an overturning of a major theory of physics. 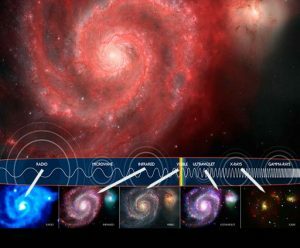 Since the earliest classification of Hertzian Waves to our modern advances in radio astronomy, we now know that the radio portion of the spectrum is the largest range of electromagnetic radiation given off by objects in the Universe. Radio astronomers build telescopes that can pick up wavelengths of radio light ranging from fractions of a millimeter to tens of meters long. Our receivers can tease open these waves to pick out signals of fascinating objects, such as pulsars, that change their radio wave output in thousandths of a second. And we can comb through the waves for the fingerprints of atoms and molecules spinning in the dark. With radio telescopes, we reveal the deepest and darkest secrets of the Universe. Want to know more? Here’s a more advanced guide to the types of radio waves our telescopes observe from space.